To some, red velvet cake may pose a bit of a mystery as this rich, chocolate-flavored cake features a red hue that may range from bright to dark. Red food coloring gives this cake its color in modern times; however, it was originally made with beets and cocoa. The cake traditionally gets its chocolate taste from devil's food cake. Grocery stores, bakeries and specialty shops often sell red velvet cake, but you can make it in your own kitchen as well. A 4 ounce serving of red velvet cake with cream cheese frosting contains 400 to 453 calories. Considering that a healthy meal generally consists of 300 to 600 calories, according to The Diet Channel, this puts red velvet cake out of reach for most people as a dessert unless you consider consuming a far smaller portion. Red velvet cake is quite high in fat, containing 18 to 23 grams per serving, with up to 4 grams of saturated fat and 1 gram of trans fat, both of which can be damaging to your health. Each serving also contains 73 milligrams of dietary cholesterol, approximately 25 percent of the 300 milligram daily limit. One 4 ounce serving of red velvet cake has about 54 grams carbohydrates. Based on a 2,000-calorie diet, MedlinePlus recommends you get 40 to 60 percent of your daily calories from carbohydrates. You will also get 4 to 5 grams of protein in the same size serving of red velvet cake. Your meal plan should include 50 to 65 grams of protein each day. 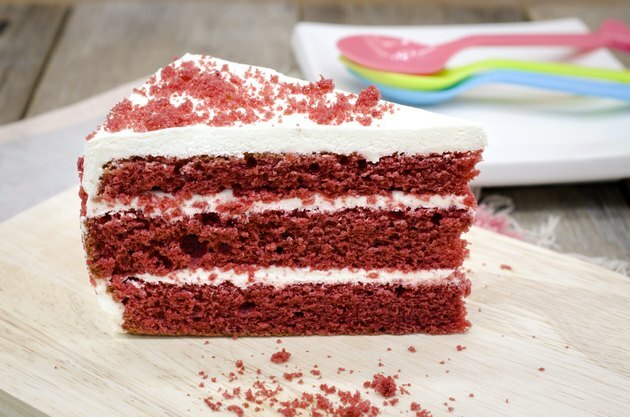 One serving of red velvet cake provides you with 8 percent of the daily recommended intake of iron, a mineral you need to ensure proper oxygenation of your body. Eating a serving of red velvet cake also gives you 3 percent of the vitamin A and calcium you require daily. The sugar and sodium content in red velvet cake put it out of reach for many people. It contains 330 to 333 milligrams of sodium per serving, approximately 20 percent of 1,500 milligram limit recommended by the American Heart Association. Your meal plan should include fewer than 25.2 to 37.8 grams of sugar; however, one 4-ounce serving of red velvet cake contains 40 to 42 grams.